Another spring unfolds, days warm, flowering trees unfurl and catch us by surprise when glimpsed through the garden. Something happens to us this time of year; a longing for things past. We close our eyes and remember moments we would like to experience again. Perhaps sitting beside one of our parents listening to them read aloud, or a time when we were teenagers waiting for our first kiss. Whatever this nostalgic time-traveling is about, it has to do with younger days, when we played with the neighborhood kids, caught fireflies in a jar, spent the night with a grandmother who baked the best chocolate cake in the Mill Village. We would like to walk along the Main Street of our youth, filled with cars, people shopping, meeting and greeting one another. We would like to stop and wave at the train as it goes by. We wish family and friends were still alive to answer the questions we now have for them. If only we could spend time with D.J. Rose, the leading character in the story I’ve been telling you. Think of what we would learn from this young man, who over time made a lasting contribution to Rocky Mount. The future that is being reimagined today is partially built upon the architectural assets he and his company contributed to this sense of place. I believe Fennel Hudson, A Meaningful Life, is right when he wrote: “Old buildings whisper to us in the creaking of floorboards and rattling of windowpanes.” Listen for Mr. Rose’s whisper when you think of the Ricks Hotel, the original Masonic Temple on Main Street, the May and Gorham building, Rocky Mount Municipal building on Main Street. the Peoples Bank building, the First Methodist and First Presbyterian Churches, Planters Cotton Seed Oil factory, Rocky Mount’s Railroad Passenger Station including the addition of the second and third floors, Rocky Mount’s first electric power plant and water plant, as well as portions of the building you know today as The Power Plant, the Sunset Avenue Water Plant and significant portions of Rocky Mount Mills buildings. 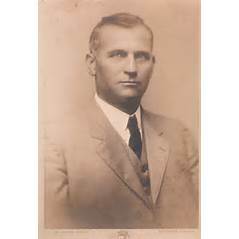 Some of the schools he built are Abraham Lincoln, R. M. Wilson School and Edgemont. The firm he founded, D. J. Rose and Son Inc., is the oldest continuously operating general contracting firm in North Carolina and to this day maintains the North Carolina General Contractors License number 27. The contracting firm D. J. Rose and Son Inc., based in Rocky Mount, North Carolina, has donated a major collection of historic architectural drawings and other documents to the North Carolina State University Libraries, which forms the basis for the presentation on the 29th. Here is an opportunity to keep company with D.J. Rose once again in the whispering of these drawings. Use your imagination…slip into a seat beside him for a lovely evening honoring his work. See you there, I’ll save you a seat! This entry was posted in D.J. 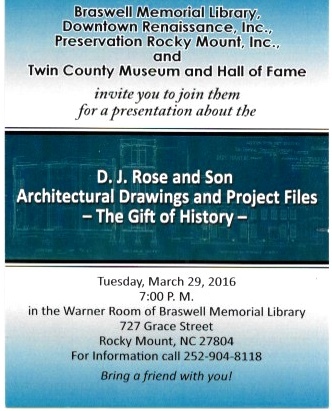 Rose Contractor -Rocky Mount NC and tagged 2016, Braswell Library Presentation -March 29th, D. J. Rose, D.J. Rose & Company-Rocky Mount NC, Historic Downtown Architecture, The Gift of History. Bookmark the permalink.